EUROPEAN UNION AGRICULTURE Commissioner Phil Hogan has said he received 500 text messages in one day this week about animal welfare issues, as he attended a conference in Brussels to discuss sustainable farming. After his keynote speech on Wednesday, the floor was opened up for questions and Hogan was called on by a member of the Compassion in World Farming organisation to give his views on live exports. The organisation has been involved in a number of investigations in countries in the Middle East, to show the kind of treatment farm animals are subjected to once they leave European countries. They have previously said cattle exported from Ireland to Libya are “beaten, stabbed, dragged by the eye sockets”. Olga Kikou, asked Hogan how sustainable the current policy of live exporting is to third countries where EU laws on animal cruelty do not apply. Will the Commission listen to the voices of citizens who demand higher welfare standards in our farming practices and stop the export of live animals beyond EU borders replacing these exports by exports in meat? The Commissioner began his response by telling the woman that he would not be “bullied by 500 text messages I’ve got on my phone during the course of the day on animal farming and animal welfare issues”. He said he was “not going to give a direct answer in relation to the manner in which animals are exported” to other countries. But he said he hopes and expects that the regulations in place are robust for animals going to third countries. Hogan also said that some EU member states have implemented improved measures in relation to animal welfare issues for the first time as part of the rural development programmes. A spokesperson for Compassion in World Farming said animals are being sent in their millions to place across North Africa and the Middle East “where they endure horrific slaughter and the Commission is not acting to stop this”. 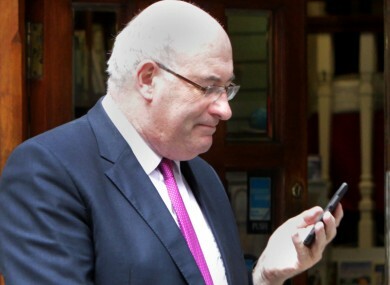 Email “Phil Hogan got 500 texts in one day about animal cruelty”. Feedback on “Phil Hogan got 500 texts in one day about animal cruelty”.